We also cover vacancies in the interlinking industries of Finance, Technology, emerging technologies, Crypto, Blockchain and Games. We make it simple for employers worldwide to post vacancies and connect with great candidates. Our markets are in the main European, exceptionally strong in Malta, UK, Spain, Gibraltar, Portugal, Estonia, Ukraine,Czech and Bulgaria and growing rapidly elsewhere. We cover candidates from hundreds of countries, hiring in dozens of languages with most candidates happy to relocate. All of our candidates are specific to the industries we cover or bring highly sought after transferable skills to the table. We have a well read Blog offering candidates hints and tips for their job search. Giving our candidates the best path to their new career drives us. 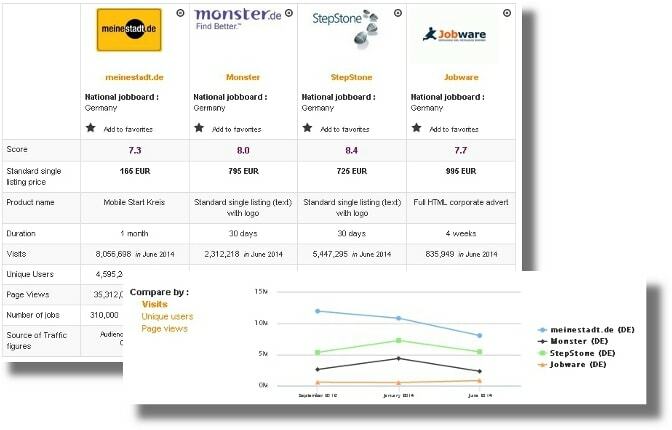 JobsFactor makes it easy for employers to cut through and find the best fit for the role. Looking for the best talent? Post your vacancies. Takes around 1 minute to publish a job and we are priced to give you a solid ROI. Ready to join the most innovative industries in the world? Sign up. Simple registration process for both candidates and employers. Candidates can also upload their CV and recruiters or hiring managers have access to our rapidly growing searchable candidate database. Summary: JobsFactor specialises in iGaming, Blockchain, Finance, Cryptocurrency and IT Technology jobs. The niche job board has only been around for a couple of years and the team behind the scenes is still small, but that hasn’t stopped them from reaching out to recruiters from all over the world. The owners, Mike Rudkin and Michael R., have worked in recruitment and consultancy before and is involved in other projects. The headquarters are in Malta. On social media, the job board shares far more on Facebook for its 469 followers, than it does on Twitter (nothing since October for 12 followers) and LinkedIn (only 31 followers). Job offers are being posted none the less, so it’s worth checking out the site directly to see where the opportunities are. Design: The homepage suggests different search options. You have the search engine (keywords and the location), company pages (all 56 of which are hiring), featured jobs, latest jobs and different jobs by category and location. In the job listing, there are visible publication dates, logos and company names. The filters are the category, the job type, the salary range and the country (the number of offers per subcategory is in brackets). An open job offer displays the location, the publication date and keywords at the top of the page and salary information under the description (which will only ever say “negotiable”). For more information on the hiring company, you can check out their page. The company pages are straightforward: a description and a job offer panel. A logo is visible at the top of the page, as well as the company location and website for some of the companies. You can request e-mails for new opportunities within a specific company. The job board objective: JobsFactor focuses on the gaming and IT industry for a more refined search for both jobseekers and recruiters (at a low cost). Recruiter observations: Recruiters can post a job offer for very little or opt for unlimited posting over a defined timeframe. However, accessing the CV database isn’t possible without a paid account. 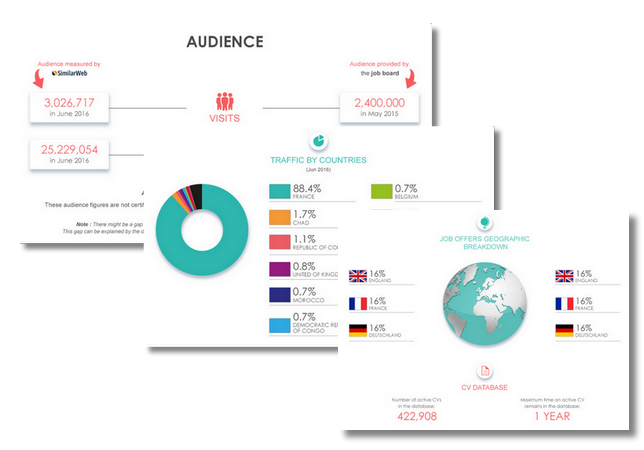 The dashboard includes the job views, the application rates and the apply clicks. Salary information is not compulsory. Jobseeker observations: Jobseekers have their application sent to an e-mail address or they are redirected to a website. You can register with Facebook or an e-mail address. The job offers: there are currently 3 102 job offers on the site, most of which are in iGaming and information technology. Special features: The blog (keywords appear on the right-hand side); job alerts (with varied frequency). Verdict: There aren’t many special features on this site, but the transparency regarding job offers and hiring companies is appreciated. For what it costs, it’s worth taking a chance on JobsFactor. Login here for FREE to unlock access to the traffic audience, content and pricing section for more information on JobsFactor.